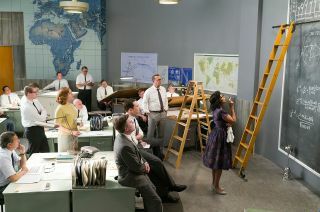 The ladders and blackboards seen in this still from the new movie "Hidden Figures" are among several subtle nods, or Easter eggs, to NASA's early space race history. The 20th Century Fox film "Hidden Figures" tells the untold story of the African-American women who worked for NASA as "human computers" in the early days of space race. The movie, which opened wide in U.S. theaters on Friday (Jan. 6), recreates the settings and portrays some of the real-life people who made it possible for the United States to launch its first astronauts into space. "Hidden Figures" takes its audiences into the behind-the-scenes work of the Space Task Group at NASA's Langley Research Center in Virginia and introduces them to mathematicians Katherine G. Johnson (Taraji P. Henson), Dorothy Vaughan (Octavia Spencer) and Mary Jackson (Janelle Monáe). Though "Hidden Figures" primarily focuses on the "colored computers," the African-American mathematicians are not the only trailblazing women celebrated in the movie. In a brief scene that goes by quickly, astronaut John Glenn (Glen Powell) is shown posing with his Mercury spacecraft for a reporter's photo while a woman dressed in coveralls kneels beside the capsule holding a paintbrush and small can. The scene is based on a NASA photo showing Glenn with spacecraft logo artist Cece Bibby. "That's one of my favorite easter eggs in the movie," said Bill Barry, NASA's Chief Historian. Cecelia "Cece" Bibby, who died in 2012 at the age of 84, was recruited by Glenn to hand-paint the insignia on the outside of his Mercury spacecraft, Friendship 7. As such, she was the first and only woman to ascend the gantry and go inside the "white room" that surrounded the capsule on the launch pad. In the movie, the scene is moved to inside a hangar, but otherwise is fairly faithful to the historic image, down to the McDonnell company logo on the back of Bibby's coveralls. The scene also includes a second Easter egg: the woman who portrays Bibby is Cyndy Powell, Glen Powell's mother. ohn Glenn (Glen Powell) and Cece Bibby (Cyndy Powell) pose for a reporter's photo in "Hidden Figures." In its recreation of NASA, "Hidden Figures" includes sets that are based on real locations, like the Mercury Mission Control, but also features settings the filmmakers designed to make the movie more visually interesting. "Langley was a series of red brick buildings, all with cinder block walls, and that is very good as a work environment but it is not necessarily the most interesting thing to look at when you are making a movie," stated production designer Wynn Thomas in an interview with collectSPACE. One location used in the film however, perfectly combined authenticity with aesthetics: the wind tunnel where aspiring engineer Mary Jackson (Monáe) gets the heel of her shoe stuck in a grate before a test of the Mercury spacecraft. The wind tunnel looked real because it was real. "Fortunately, there is a Lockheed Martin facility in Marietta, Georgia that has a wind tunnel that they had not changed since they first built it, so it was period correct," described Thomas. "And we were very lucky, the timing was perfect for us, because they were about to fix it up — gut it, tear it up and put in a new one." A painting that hung at the real Langley Research Center is seen in the background in "Hidden Figures." Most of the scenes in "Hidden Figures" that are presented as being at Langley Research Center in Hampton, Virginia, were filmed in Atlanta, Georgia, at Morehouse College and at area locations. But that does not mean that a bit of the real NASA facility did not make it into the movie. "In the movie, when Johnson (Henson), Al Harrison (Kevin Costner) and Paul Stafford (Jim Parsons) are standing in the lobby discussing if Johnson can join them in a meeting, you can see in the background two paintings of airplanes," said Barry. "They originally hung in the main headquarters building at Langley." Today, that building is occupied by the Air Force, which no longer wants them, so NASA was — and at last check, still is — planning to excess them. Continue reading at collectSPACE for the 4th and 5th Easter eggs in "Hidden Figures." Follow collectSPACE.comon Facebookand on Twitter at @collectSPACE. Copyright 2017 collectSPACE.com. All rights reserved.